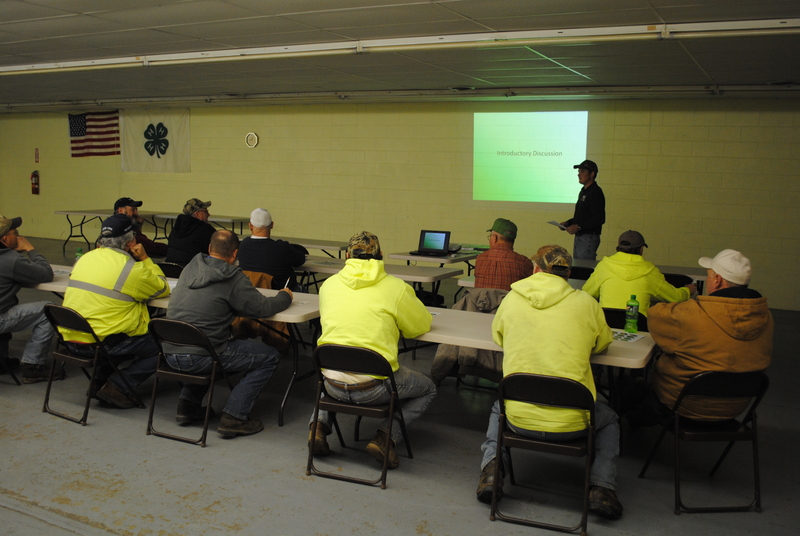 On Tuesday, 3/26/2013 an invasive plant workshop was held at the Logan, OH Hocking County Soil and Water Conservation District building. The workshop was an collaborative effort among the Hocking, Vinton, and Fairfield SWCDs; OSU-Extension; and the AOWCP. Discussions included invasive plant ecology and identification, early detection and rapid response, and preventative measures and best management practices. A total of 12 right-of-way managers attended. A special thank you to the presenters: Cody Hacker – Vinton SWCD, Eric Boyda- AOWCP, and Jonathan Ferbrache – Fairfield SWCD. The AOWCP will work with partners to continue holding similar workshops in additional counties. Interesting article about why japanese barberry should be controlled. We apologies for the technical issues that prevented the holding the Great Lakes Early Detection Network (GLEDN) Mapping Webcast yesterday as planned. The server at Purdue that runs Adobe Connect was down yesterday for about an hour, right at the time the webcast was scheduled. The webcast has been rescheduled for April 2 at 11:00 Eastern/10:00 Central. The webcast will be recorded and posted on the MIPN website for those who are not able to listen in. I encourage you to attend the webcast if possible, though, because you will have the opportunity to ask questions about how to use GLEDN. Please contact appalachianohioweeds@gmail.com if you are interested in obtaining information to join the meeting. Non-Native Invasive Species Best Management Practices, Guidance for the U.S. Forest Service, Eastern Region. March 13, 2013: The Eastern Region is proud to announce release of Non-Native Invasive Species Best Management Practices, Guidance for the U.S. Forest Service, Eastern Region. Organized by the Athens Forest Stewardship Club in collaboration with the Athens Conservancy, Athens Trails, Friends of Strouds Run State Park and Rural Action. 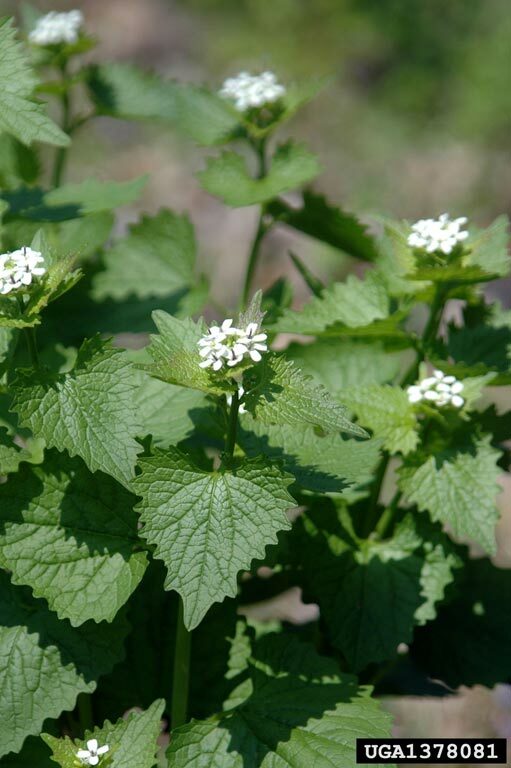 As in past years, volunteers will remove garlic mustard (Alliaria petiolata) from Strouds Run State Park, City-owned preserve land, Athens Conservancy preserves, and along the Hocking-Adena Bikeway. Doing so will help protect our native flora from this troublesome invasive weed. Garlic mustard reproduces prolifically, displacing the diverse wildflowers and ferns that were there before the mustard invaded. Garlic mustard also suppresses the fungal partners (called mycorrhizae) in the root system of most trees and many other plants, which the plants depend on to help absorb enough water and minerals from the soil. New research indicates that the overabundance of white-tailed deer is contributing to the spread of garlic mustard by eating many of the competing native plants. Deer find garlic mustard distasteful and seldom eat it. Everyone is welcome to participate in any of the events, whether or not you are affiliated with the sponsoring organizations. Except for the March 17 and 24 work sessions, you do not need to notify anyone in advance to participate, but a contact person is listed below for each event in case you have questions. In general, heavy rain will cancel outings but a light drizzle will not. Children are welcome at most of the work sessions, but caution is needed in Blue Ash Valley and the Bluebell Preserve because the mustard in these areas is intermixed with lots of wildflowers, which are easily trampled. Children with a gentle temperament will do fine even at these sites, but rambunctious kids may do more damage than good. What to bring: drinking water, sun protection, sturdy footwear, garden gloves (optional, but recommended if you are allergic to poison-ivy). No tools are needed; the mustard plants pull out easily. For protection against poison-ivy and thorns, socks and long pants are strongly recommended. Between April 22 and May 19, anyone working in the woods should wear a bright orange vest or cap because it is turkey hunting season. Turkey hunting is permitted only in the morning between April 22 and May 5. From May 6 through May 19, it is permitted all day. Turkey hunting is permitted at Strouds Run State Park but not in the other areas where mustard pulling is scheduled. In addition to the weekend outings on this list, there will be a few work sessions on weekdays, probably scheduled only a few days in advance based on the weather forecast. These will be announced via the listservs of the sponsoring organizations, but anyone who is not on one of these listservs and would like to be alerted when a weekday work session is scheduled, please contact Phil Cantino (pcantino@gmail.edu). Saturday, March 16, 1:00 p.m.
Sunday, March 17, 1:00 p.m.
Saturday, March 23, 1:00 p.m.
Sunday, March 24, 1:00 p.m.
Saturday, March 30, 1:00 p.m.
Sunday, March 31, 1:00 p.m.
Saturday, April 6, 9:00 a.m.
Saturday, April 6, 1:00 p.m.
Meeting place: parking area on west side of SR-690, 0.5 mile north of US-50, about 1 mile east of Dow Lake dam parking lot. Note: It will be necessary to wade a small stream, which is usually ankle-deep but may be deeper following rainstorms; keep in mind when choosing footwear. Sunday, April 7, 9:00 a.m.
Sunday, April 7, 1:00 p.m.
Saturday, April 13, 1:00 p.m.
Sunday, April 14, 1:00 p.m.
Saturday, April 20, 9:00 a.m.
Sunday, April 21, 1:00 p.m.
Saturday, April 27, 9:00 a.m.
Sunday, April 28, 9:00 a.m.
Sunday, May 5, 1:00 p.m.
*The parking area for the Haley and Hank Trail work sessions is about a 20-minute drive from Athens. Go out Strouds Run Rd. and into the state park. At the main junction in the park, instead of turning left to the campground or right to the beach, continue straight on Strouds Run Rd. You will climb a steep, winding hill, with a junction at the top (Scatter Ridge Rd.). Stick to the right at this point (the name of the road you want to follow changes at this point to East Scatter Ridge Rd.). Soon you will pass Pete Smith Rd. coming in from the left. Continue on E. Scatter Ridge Rd. (more than a mile) until you see Lake Hill Rd. on your right. There is a sign there for horse trail access. Turn right on Lake Hill Rd., and the parking area is on the right a short way up the road. Although the route winds a lot, you will get there if you take the right fork at every junction after the steep climb. Sorry everyone, but we had some technical difficulties with the webcast software. We will let you know when we reschedule the webcast. Please email appalachianohioweeds@gmail.com for conference details for the upcoming NRCS Biology Webinar, “Why Some Wetland Plants Are Invasive and How They Affect Restoration” on March 26th, 2013 at 2-3:30 pm (EST). The presenter will be Susan M. Galatowitsch, Ph.D. (Professor, Restoration Ecology, Department of Horticultural Science, University of Minnesota, St. Paul MN http://www.consbio.umn.edu/SG/;galat001@umn.edu; Telephone: 612.624.3242). Dr. Galatowitsch states, “The proportion of wetland restoration projects affected by invasive species is likely very high. Either invasive species are present at the start of a project and their removal is attempted during site preparation or they arrive soon after, as the site adjusts to its new hydrology and vegetative cover is minimal. If the goals of a restoration project are narrowly focused on flood abatement or water quality improvement, the presence of invasive species is a minor concern. If, however, the desire is to achieve multiple benefits, including the restoration of plant biodiversity, then invasive species control is a priority. Plant communities influence nutrient cycling and food webs, provide food and habitat structure to animals, and contribute to a wetland ecosystem’s aesthetic appeal. Consequently, the restoration of a wetland’s plant communities is often considered crucial to project success. Understanding why a particular wetland plant is invasive can help frame practical restoration decisions, such as selecting effective control strategies and evaluating the commitment needed to accomplish control.”The target audience for this webinar is NRCS field staffs and partners engaged in restoration and management of wetlands and associated uplands. Please email appalachianohioweeds@gmail.com for instructions for joining the webinar. The webinar will be recorded and posted to the NRCS Biologists’ SharePoint Site and S&T Library in the event that you are unable to participate in the live webinar. April will soon be here, bringing the colors and fragrance of spring flowers, but also the unwelcome annual bloom of garlic mustard. While its name may sound like a spicy condiment, garlic mustard is actually one of Ohio’s worst invasive weeds. Native to Europe and Asia, garlic mustard (Alliaria petiolata) was introduced into New York in the 1860s and spread rapidly. It is now abundant in the northeastern and central U.S., including Ohio. It tends to move in initially along rivers, roads and trails and then spread out from there. The seeds may be carried in bits of mud on people’s shoes, as well as by floodwaters and roadway mowing equipment. Garlic mustard grows in a wide range of habitats but especially thrives in moist, shady woodlands, where it crowds out native wildflowers. Producing up to 800 seeds per plant, yielding as many as 1800 seedlings per square foot of ground, it quickly forms dense patches. Once it arrives, a diverse forest understory can quickly become a solid stand of garlic mustard. It has few natural enemies in North America; even the deer won’t eat it. Garlic mustard also contains chemicals that suppress the fungal partners (called mycorrhizae) that most plants—but not garlic mustard—depend on to help them absorb water and minerals from the soil. These chemicals even suppress everyone’s favorite spring mushroom, Morels. Garlic mustard is a biennial. It spends its first year as a low-growing rosette of yellowish-green, wrinkly-veiny leaves. The following spring, the stems rapidly lengthen and produce clusters of small, white, cross-shaped flowers. The flower clusters are initially flat-topped but become elongate as the shoot continues to grow. The flowers develop into narrowly cylindrical green fruits, which eventually turn brown and release their seeds, after which the plant dies. Garlic mustard is easily distinguished by its kidney-shaped to triangular, prominently veiny leaves with a garlicky odor when crushed. 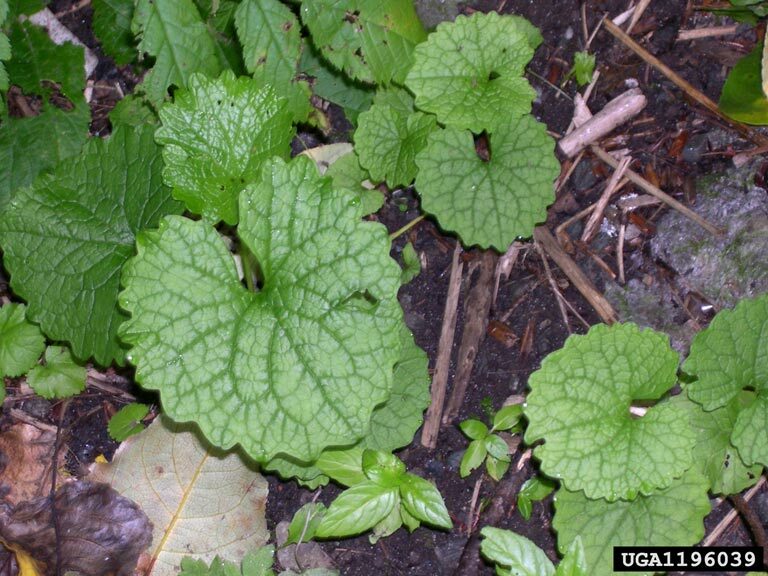 It is important to watch for garlic mustard and remove it as soon as it colonizes a site. Small patches can easily be pulled up by hand, and a weed-whip is helpful with larger infestations. However, this treatment must be repeated annually because the seeds may remain viable in the soil for five to ten years. Plants should ideally be pulled up or cut at ground level before or shortly after they start flowering. If the fruits have already started to form, then either the pulled plants should be bagged and removed or the fruits should be removed from each plant as it is pulled up. Fruits that are left attached to the plant sometimes continue development and release seeds even though the root is no longer in the ground. Larger populations may require the assistance of chemical herbicides. 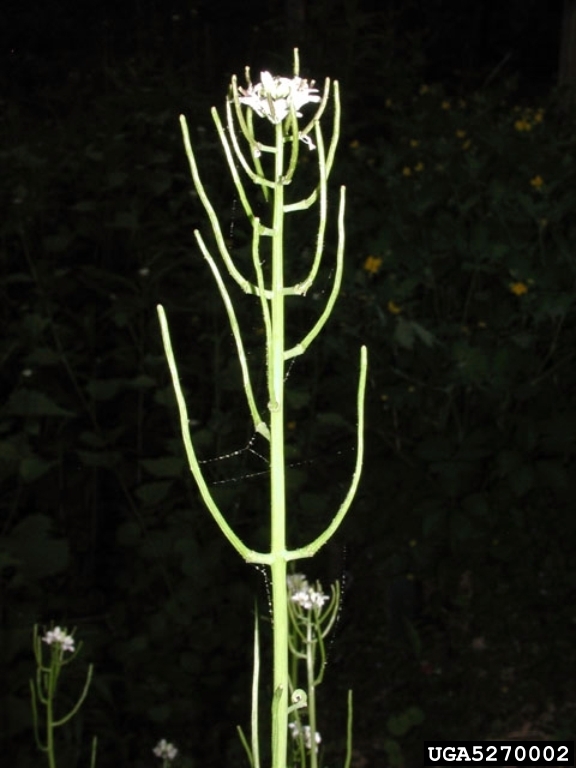 Additional information about the ID and control of garlic mustard can be found in this OSU-E garlic mustard factsheet or watching this video by our partners in West Virginia. Additional questions can be answered by contacting Eric Boyda at appalachianohioweeds@gmail.com or 740-534-6578. Article written by Phil Cantino. The Midwest Invasive Plant Network is hosting a free webcast to provide on overview on how to use the Great Lakes Early Detection Network, with special focus on using the Maps feature to view distribution maps for your species or area of interest. The webcast will be held March 12 from 12:00-1:00 Eastern/11:00-12:00 Central. Send an email to appalachianohioweeds@gmail.com for information on how to connect to the webcast.